At Learn And Explore we develop the “whole child”. This means that we focus on developing communication, social and emotional, thinking, and physical skills that are critical for school and life success. We accomplish this by creating a safe, nurturing, and stimulating learning environment where young learners can thrive. Our programmatic approach is based on an early childhood education principle known as “Learning Through Play”. Exploration and discovery is used as a way of learning, enabling children to develop confidence, creativity, and critical thinking skills. Learning through play creates a loving to learn attitude in children – the preeminent factor in future school and life success. 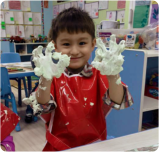 Learning And Explore Preschool creates rich environments teeming with creativity, imagination, and learning – a true springboard to developing knowledgeable, compassionate, empowered, socially and emotionally intelligent learners. Find out more about Learn And Explore’s curriculum.